» If You Love or Even Like Tennis, Turn to ESPN2 NOW! If You Love or Even Like Tennis, Turn to ESPN2 NOW! We’ve got a big situation in the Roland-Garros men’s quarterfinals. Two situations, actually. 1. Novak Djokovic, the top player in the world and the man currently attempting to hold all four Grand Slam titles at the same time for the first time since Rod Laver in 1969, is in trouble against Jo-Wilfried Tsonga. The electric Frenchman, with the wind of a partisan crowd in his sails, recovered from a poor first set to take the next two. 2. Roger Federer lost the first two sets to Juan Martin del Potro, otherwise known as the only guy not named Rafael Nadal to ever beat Federer in a Grand Slam final (U.S. Open, 2009). 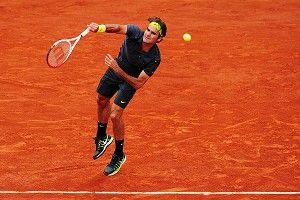 Federer recovered to take the next two sets with relative ease, but del Potro nearly broke him in the first game of the deciding set. With a few exceptions, it’s been a foregone conclusion that Grand Slam semifinals will consist of Djokovic, Federer, Andy Murray, and Nadal. But a wild day in Paris is threatening to upset the power structure, and I just thought you guys should know. Tennis joke. Happy to be of service.